The winning sushi roll was created as a result of Asuka’s understanding of the characteristics of both Italian and Japanese ingredients, which along with her fundamental knowledge of sushi techniques, produced a perfect combination of Italian and Japanese cuisines. Made using salmon marinated in KIKKOMAN Soy Sauce and red wine, two coloured halves of sushi rice (Sushi vinegared rice and red wine vinegared rice), mascarpone, sun-dried tomato puree, capers, dill, basil, rocket, chives and Nori seaweed, along with an accompaniment of KIKKOMAN Soy Sauce and red wine foam, as well as a sushi ginger and sesame crispy cracker, ‘Precious Memories’ was born. About her inspiration, Asuka tells us, “My mother had a pizza restaurant and so I grew up familiar with Italian food and ingredients, so that’s where the Italian influence comes in with the mascarpone, tomato puree and red wine. I’ve travelled to Rome, Florence and Parma, and the food is so nice! I’m also influenced by where I’m from, Nagano, which is also famous for grapes and its red wine”. Red wine is certainly an interesting choice for sushi, as Asuka continues: “People usually drink sake, beer or white wine when they eat sushi, so I wanted the challenge of using red wine; the sushi rice also has wine mixed into it”. Having been based in London for over ten years, and as an experienced chef at Matsuri, St.James’s, Asuka has certainly noticed a change in our appetite for sushi: “Sushi is becoming more popular. It used to be that people were like ‘raw fish? !’, but now customers know the names for the fish in Japanese and ask for maguro instead of tuna”. Along with our growing appetite for sushi, people’s ideas towards female sushi chefs have also changed. Working in what is still a very much male dominated vocation, Asuka tells us, ‘I used to find some customers a bit negative but now it’s changing, it’s the 21st century and people are more open-minded. ’Thanks to her well earned win, perhaps we’ll see more female sushi chefs coming to the fore. Precious Memories combined flavours and ingredients that have been significant to Asuka's development as a chef: red wine from her home region of Shimano, and British-sourced salmon which she has come to love. The roll, stuffed full of salmon marinated in KIKKOMAN Soy Sauce, mascarpone, tomato puree, dill, and basil, was accompanied by a red wine mousse, a grated ginger cracker, and basil-infused olive oil. Asuka is the first ever female Japanese sushi chef to take part in the EAT-JAPAN SUSHI AWARDS. She has a decade of experience, and today produces fantastically fresh, authentic-with-a-London-twist sushi from the intimate sushi counter at Matsuri St. James's. She is particularly adept at roll sushi, making her a fearsome rival in this competition. Asuka is also a skilled teppanyaki chef, and her diverse experience with a range of cooking techniques informs her innovative approach to sushi. As the flagship for the Matsuri group, Matsuri St James’s has been designed to re-create the atmosphere of a Japanese festival (in other words, a matsuri). The theme is carried out throughout the restaurant, from the taiko drum and the nebutamask at the top of the staircase, to the brightly-coloured kimono which the waitresses wear. Upon entering, you are escorted down a wide staircase and directed to your table in the Teppan-yaki Area where you can feast with all of your senses as you watch the natural flavours of the food being seared in before your eyes. Alternatively, you can delight in our freshly prepared sushi at the Sushi Counter. If more privacy is desired we have two Private Rooms with Teppan-yaki tables which can be hired as a single room (8 people maximum), or as a double room (16 people maximum). Click here to find out more about Matsuri St. James’s. 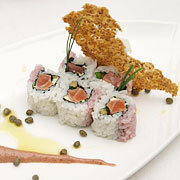 This sushi roll was all about delicious and natural, healthy produce. Beautifully wrapped in a finely peeled cucumber strip; tuna, salmon, amberjack, crab, daikon, shiso leaves and rocket with yuzu sauce (yuzu, KIKKOMAN Soy Sauce and onion) creating a fresh yet rich flavour. Using different parts of young yellowtail to show its varied textures, along with a light miso dressing, Silla used the lean part to fry in Tsuno Foods Rice Bran Oil for a crispy tempura, and the fatter part of the yellowtail minced to make a tartar. Mixed with fresh yuzu flavoured tobiko, a summery sensation was born. Wanting to create a sushi roll fusing Korean and Japanese elements, Thomas used salmon marinated in kimchi (spicy pickled vegetable sauce), and pear and apple juice to bring out a natural sweetness. Mild Moshi Moshi dressing and KIKKOMAN Soy Sauce added more complex flavours to a bold creation. Simple, quality ingredients of wild scallops and avocado created a melt in your mouth sushi without any use of mayonnaise or oil. This entry maintained the authenticity of the original concept of sushi, bringing out the best of the ingredients in a subtle way. Dipping into KIKKOMAN Soy Sauce completes the taste.